This was another “across the miles” craft with Nana over the web cam, and blends in with our camping theme. When you’re out camping you don’t have access to electricity, but you still need to eat. So how can you cook your food? 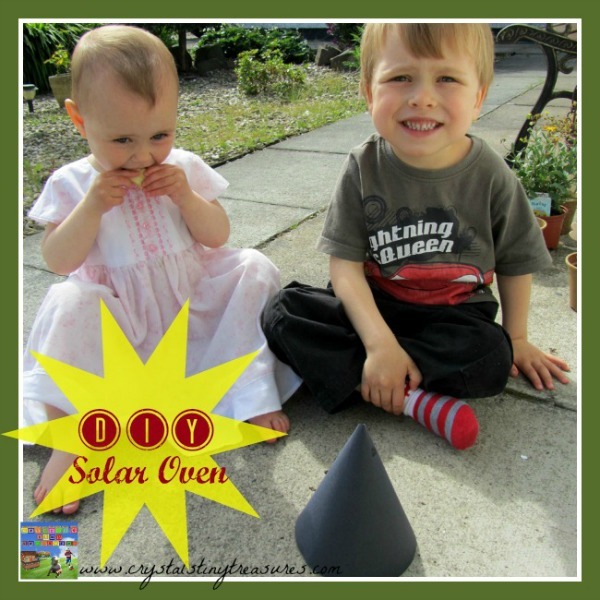 By making your own solar oven, of course! Of course, in Saskatchewan it gets a LOT hotter than it does here; about 10-20C hotter! But you don’t know how something will work unless you give it a try, do you? And besides, it’s also lots of fun! 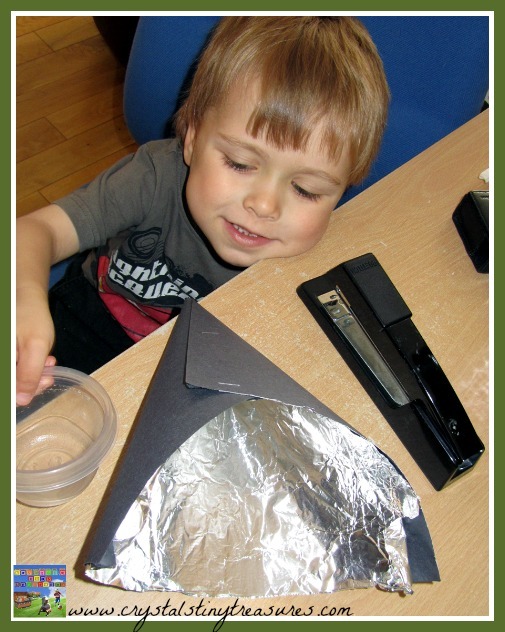 To make his solar oven, Tristan took a piece of black construction paper and covered it with tin foil. 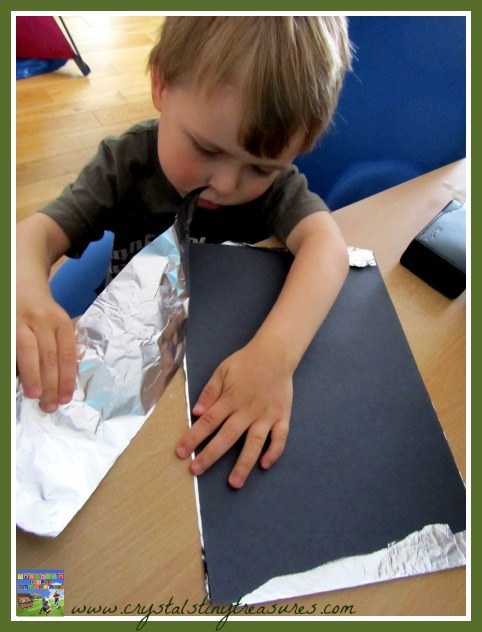 He folded the edges of the tin foil over to make it the same size, then he gently tore off the excess tin foil. 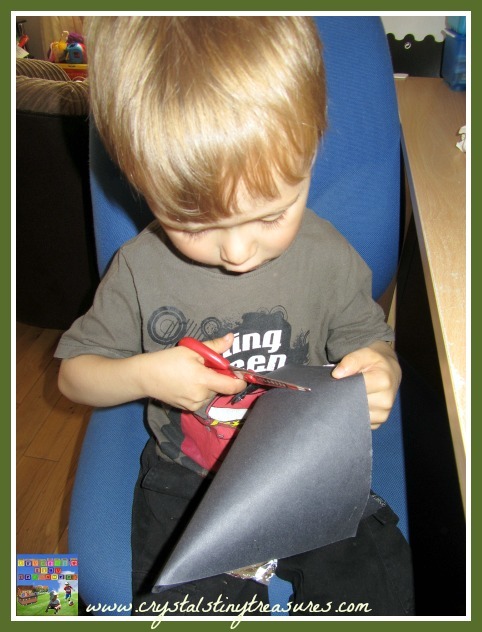 Next he glued the foil to the construction paper, with the shiny side out and the dull side against the black paper. Then he turned the form into a cone shape and gave it a couple of stitches with a stapler to hold it together. A little adjustment was needed to enable the cone to sit level, so he cut it even. Then it was time to cut an apple into fine slices, add a little cinnamon and a few raisins and put them in a little clear plastic container. We used one with a lid to keep out little critters like ants. We took the lot outside and found a bit of that elusive sunshine and placed the pot on the ground and covered it with the solar oven and waited. And waited. And waited….The clouds passed over the sun and the temperature dropped, and after 2-3 hours the children ate their apple desert after supper. Tristan said it was good, but it wasn’t quite cooked the way it should have been. We’ll have to wait for another warm and sunny day (there must be more than 2 in a summer?) and try again. 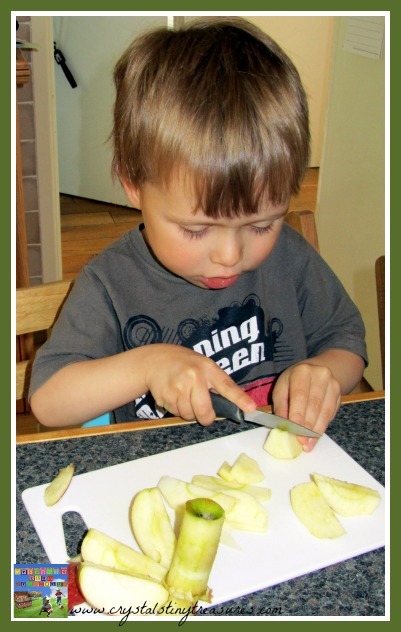 This activity takes into account so many skills and learning opportunities: fine motor skills, science in the way the sun heats and cooks the food, healthy eating, learning about how to cook without electricity, ecological living, how weather can impact food production, and patience as well while you’re waiting for the apple to cook! Please let us know if you try this, or have tried something similar and how it has worked for you! For more camping themed ideas, we’ve made S’mores, an indoor campfire, and drop by our indoor camping page as well. 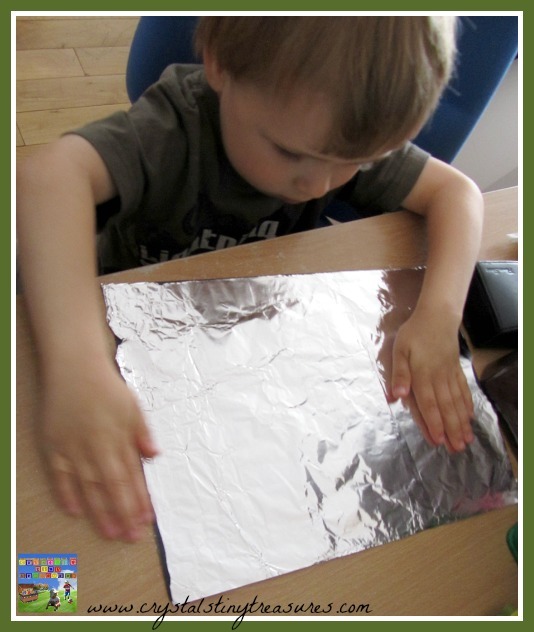 For science ideas, why not try our Sink or Float experiment, make your own thermal water bottle cover, or see our other ideas on our science page and summer fun page. Thank you. My mom always has good things to do over the webcam with the kids! We’re enjoying trying to link our projects, thank you for hosting, sharing, and ‘liking’ us! You have a great week, too! I am so going to try this, thanks for posting! 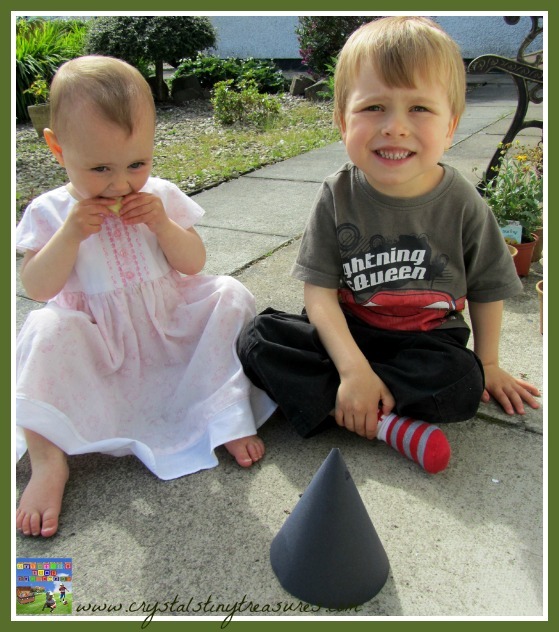 I have a solar based day camp coming up and have a question~ is the cone open at the top at all to let in the sunshine? I was thinking of trying this to see if it works better than a fast food box lined with foil. Hello! The cone isn’t open as by having it closed it keeps the heat from escaping. The black paper absorbs the heat from the sun and the foil reflects it around the food. We haven’t tried the fast food box type yet, please let us know which one works better, it’ll be interesting!